Takht-e Soleyman is the holiest shrine of Zoroastrianism and the most important relic of the former Sassanid Empire. The archaeological site dates from the 6th century. It was partially rebuilt during the Ilkhanid period (13th-14th century): they added new constructions and reused the site as a palace. The site officially comprises one location, but there are 6 sublocations such Takht-e Soleyman with its firetemple and Anahita temple, the small hill Zendan-e Suleiman (‘Solomon’s prison’), a mountain to the east that served as quarry for the construction of the site, the archaeological mound Tepe Majid and Belqeis Mountain with a citadel. Takht-e Soleyman is one of these names on the WH List that mean nothing unless you’ve been there. It ranked among the very lowest in our recent Community and Popular Votes for the WHS Top 200, probably because almost nobody had visited it (13 were there before Solivagant and I visited in April/May 2016). It ended up being my favourite WHS of Northern Iran, both for its colourful mountain scenery and introduction to Zoroastrianism. We spent 3 hours there, but I could easily have stayed an hour more. Takht-e-Soleyman (meaning: “the throne of Solomon”, an apocryphal name given during the Arab conquest) was the spiritual center of Zoroastrianism. It was created in the 6th century by the Persian Empire of the Sassanids, who were in fierce competition with the Byzantine Empire and Christianity and wanted to build a showcase for their own citizens. Despite reading various sources beforehand and listening to the explanations of our tour guides, I find summarizing the faith of the Zoroastrians difficult. They worshipped one god, but in their temples the focus is on the four elements of water, earth, air and fire. The combined presence of a volcano (fire) and a natural spring (water) made Takht-e Soleyman an especially auspicious location for Zoroastrians. After a nutritious lunch in the canteen of a nearby mine where we met two bewildered French tourists travelling with their own campervan, we started our visit at the volcano. This is nicknamed ‘Solomon’s Prison’ (Zendan-e Soleyman): folk tales suggest that King Solomon used to imprison monsters inside the 100 m deep crater. This small volcano can easily be climbed in 20 minutes or so, though it had previously been raining so I found the path to be quite slippery. And near the top you have to do some rock-climbing. Long ago Zoroastrian rituals were performed at this summit, but now it is mainly a natural spectacle: an empty, hollow volcano crater with a grass-field at the bottom. The core zone of the WHS consists of several archaeological sites a few kilometers apart. The main sanctuary lies 2 kms away from the volcano. It is completely walled and resembles a fortress. A more than 60 meters deep lake is the surprising centerpiece. The water flows from here down the hill, and irrigates the surrounding agricultural land. It uses the ‘dragon wall’, a 2m high natural wall shaped by the sediments transferred alongside the water. Our guide told that this sanctuary was especially made for the royals and the army of the Sassanids. Elsewhere in their state (for example near the Sasssanid capital Ctsesiphon in Iraq) there were spiritual centers for the general population. One of the most interesting buildings on the property is a long vaulted gallery, with an opening every few meters for a soldier to stand guard. 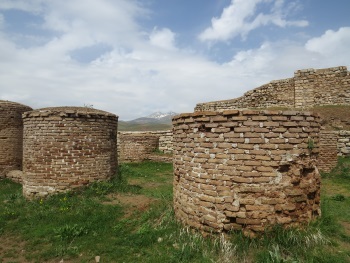 It’s a bit of a mystery what the use of all these buildings was, and not all date from the original Sassanid construction (the later ‘Mongol’ Ilkhanid dynasty used the site also). Photos in the on-site museum show that Zoroastrians still come here once a year, though the fire in the fire temple (a little square platform) has been extinguished long ago. After the Islamic Revolution of 1979, a lot of Zoroastrians have fled Iran. Their religion however is officially recognized, and I saw a modern Zoroastrian temple in Teheran (it lies close to the St. Sergius Armenian Church, in the affluent north of the city). The fun isn’t over after you’ve left the core zone. My fellow travellers at this point in the trip had gotten the hang of spotting WHS signs, guessing possible OUV and debating conservation factors. Driving down from Takht-e Soleyman to Zanjan via the Dandi road, they were as amazed as I was by the long cableway that connects these mountains with the nearest town. Raw metals are transported this way. It must be worth of WH status as the ‘longest cable car traject in the world’! As icing on the cake we also were treated to a marvellous double rainbow spanning the volcanic landscape. A fine finish to a great day in off-the-beaten track Iran. 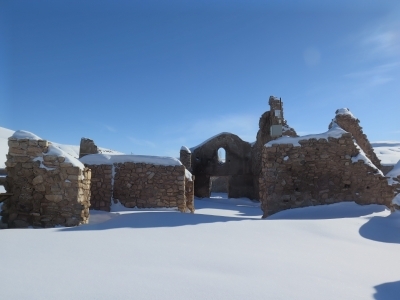 Going to Iran in winter has obvious risks of snow ruining your plans. Taking the smaller eastern road into Soleyman, it was cleared but still a few ice patches, the road leading out West was much better. However, the actual site was covered by half a meter of beautiful white snow. Missing the plowed parking spaces at the bottom I drove right up through the gate and parked next to the staff. When they pointed it out I apologized but pointed at my watch for it was getting late and they let me stay there. I will thus start a new connection of “Zoë parked here illegally” (kidding but I also have Sharjah Airport Museum, Alisadr Cave and errr Rome [/w Parking Ticket I never got to pay, long story]). The staff mainly wanted to ensure I bought a ticket so I waded over to the booth yet he didn't have change for a 500k note. In typical fashion I got waved through (I later returned to see if he has change but he waved me away again so this now on my “Zoë has free entry” connection). Either way, not the most impressive place but was worth coming up for. Wiki describes Takht-e Soleyman as being “located on a volcano crater rim” whilst the UNESCO Web site states “About 3 kms west is an ancient volcano, Zendan-e Soleyman which rises about 100m above its surroundings”. In fact the former is not on a “volcano crater rim” and the latter is not a 100m high “ancient volcano”! But Britannica isn’t so accurate with Zendan-e Soleyman which it describes as “a modest-sized extinct volcano”! Why it couldn’t have carried forward the same geological process it has correctly identified as having created Tahkt-e Soleyman isn’t clear. It isn’t alone however! The AB evaluation describes it as “This hollow, conical mountain, an ancient volcano”. On the other hand the Nomination file is very careful to describe the Zendan as simply being “volcano-shaped”. Whilst the notice board at the foot of the hill provides a correct and succinct explanation - “This mountain has been created by calcic sediments of an artesian spring”. So, both hills have been created by a process of deposition from warm saturated water which has, over many thousands of years, created limestone “Tufa” (not to be confused with “Tuff” which is a porous volcanic rock) or “Travertine”, which has gradually been raised above the previous ground level in the form of an approximately circular hill – "high" in the case of the Zendan and still relatively “low” in the case of the Takht. The only “Volcanism” involved is that which is deep underground in the Zagros Fold which has heated the underground waters - but that geological process doesn’t make, for instance, the Roman springs of Bath a “volcano”! But you can see how this misunderstanding has occurred. Zendan-e Soleyman is remarkably “Volcanic” in shape (Photo). It is only when one climbs it (Not to be missed, both for the hill itself and the views all around. As per normal Iranian practice, there is an “additional” 80k IR “entry” fee collected by a guardian who suddenly appears from nowhere!) and sees the geology of the rock, that one can appreciate the true mechanism which created it. It helps to have seen Takht-e Soleyman first, since its geology is somewhat easier to understand - the water is still present and the rising stone “lip” around the lake created by the deposition from overflows is clear. Given long enough, and without the human intervention which has diverted the overflowing waters via cuts made in the lip, it too might one day have become as equally “Volcanic” in shape and height as its neighbouring hill! Apparently Zendan-e Soleyman still had waters in its hollow centre in the time of its initial use as a shrine (remains of the original buildings are still visible as one climbs the hill) - one can imagine a certain consternation about what the “Gods” might have been "telling" the believers when it dried up around 700-500BC – at least they had the other spring to use!! Another interesting geological formation within the site boundaries which shows the extent to which the waters of the area can “lay down” limestone is the so called “Dragon Wall”. This snakes its way across the fields below Takht-e Soleyman. The streams flowing off the hill created a “wall” around 2 metres high with a channel at the top - this being raised ever “higher” by further deposition - until the waters were diverted by man! So, the channel is dry now and the “wall” is broken (Photo). The easiest place to see it is to go down hill from the main entrance and stop after the T Junction on the right. Climb the low mound - the Wall passes through the orchard in front of you. (It is easily visible on Google satellite view at 36.600645 47.231964). Hi and thank you so much for giving us a chance for writing about Takht-suleyman. 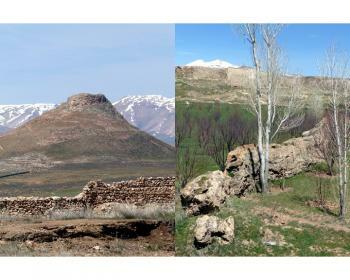 I am orignally from Takab Afshar, located 40 kilometers Northwest of the site. i grew up in Takab and i live there for 19 years. on fridays, the first thing we thought of with freinds was to go there and enjoy the beautiful scenery and weather. you know you have a kind of strength there,whenever i was there, i could breathe my predecessors. the air the took in their lungs. i feel free there. it's been 5 years i have left my home town and i was living Tabriz and now in Tehran. when i just think of this place and how much i miss it. my heart fills with the nostalgia to go there again to be and forget whatever the modern civilization have given us along with sadnesses. i miss there so much that my heart is bursting and my eyes are full of tears for i have lived this place of my ancestors. Again I thank you to give me some space to share what I feel being not there. I strongle recommend anyone who would read this material to get a chance and visit this historical fire temple of the most lovely religion of Zolostrians. You would feel what meant good speech, good deeds and good thoughts. and back to civilization you would miss it so much. The nearest larger city is Zanjan, 3.5 hours west of Teheran. You'll have to arrange transport from there. The remote site (it lies a further 1.5 hours away) can be reached via the so-called Dandi mountain road. Legends and Folk Myths: Folk legend relates that King Solomon used to imprison monsters inside the 100 m deep crater of the nearby Zendan-e Soleyman "Prison of Solomon"